How Bethany Faber Events Began! Well, I started this as an Instagram post but it became so long, it had to be a blog post! If you are curious about how and and why I started Bethany Faber Events, and what makes me different, keep reading! Last night, someone asked me how I got started as a wedding planner. I am pretty passionate about my story. The REAL story, not the watered down elevator pitch version. So I thought that I would share it with you all because I believe that it is MY story that sets me apart from many of the other planners out there. So here it goes-In 2013 I got a job as the director of Dresser Mansion. I honestly didn't truly know what I was getting myself into but I was SO excited that I got the job and was determined to be the best and make the venue the best. We had about 100 weddings a year and I consulted with every single one of those brides! I worked some of the events and got to see what made a wedding run smoothly and what made a wedding disaster. I worked with the best and the worst of vendors! My passion for making sure that every single wedding ran smoothly often resulted in me jumping in and taking over certain aspects that weren't technically my job, or sometimes, suppose to be someone else that they were actually paying to do. Some were just friends that were acting as coordinator for the day, some were professionals that were amazing! And some “professionals” asked me how to do so much, that I wondered why they were getting paid to be the coordinator. I knew that my brides needed someone who was knowledgeable, professional, and affordable to help them navigate all the details of the wedding day and execute it. Someone who wasn’t family or friend that could give an unbiased opinion based on experience and fact. There is a lot to do to get ready for a wedding before the wedding day even arrives, and if you don’t have the knowledge and experience, it can be overwhelming and too mind boggling to even know what to do! I often sat down with brides and they would come to me with their “impossible” list or start stressing out about something but by the end of the meeting I would hear “okay, I feel so much better and I can do this!”. I would evaluate the situation and most of the time, was a simple fix. But it was simple for me, not someone who doesn’t know the answer. After two years of seeing it all, I decided to start offering coordination to the brides I was already working with! I kept it pretty simple and discrete at first. But after a few, I knew I wanted to do more! But then I found out I was pregnant, so the coordination was put on hold for a little bit once baby arrived. Although, I continued to work at the wedding venue. Once my son turned a year old, I felt like it was time to get revisit the coordination but make it official this time! I couldn’t find a good name that I like that wasn’t already taken, so my name it was! I got started on a logo, website, and letting the public know I was offering coordination! That year I had about 10 weddings and used every single one as a learning experience. I self evaluated myself and asked others for feedback. It was always was and always will be so important to me for my business to provide the highest quality of service and maintain a very high standard of values and professionalism. That year went well, my son was growing and becoming busier, as well as my business. At the beginning of 2018, I sat down to begin working on my goals for the year. The number one goal was to make Bethany Faber Events my full time job and be able to leave my job at the wedding venue. I want to add this disclaimer that I loved my job at Dresser Mansion and will always look back at it with fond memories. But life has seasons and all good things must come to an end. I was paying for someone else to raise my son, and coming home exhausted at the end of the work day, to turn around and begin working on my business. I loved both. But it was time for one to go. I was so passionate and determined to make my business work. And that is exactly what I freakin’ did! I July 2018, I said adios to the wedding venue and hello to self employment. So why did I start Bethany Faber Events? Because I have a passion for helping people. I want to make sure that my clients and colleges are all taken care of. I call myself to project manager for the wedding. I make sure my client is happy and has everything they need and that my team of vendors is working properly and have everything that they need to do their job effectively. 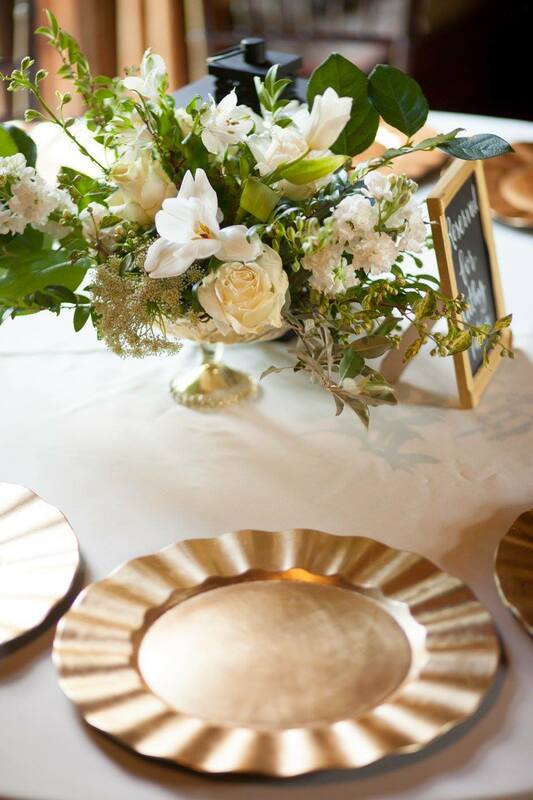 Bethany Faber Events is a passion project and I am so thankful every day to call it my job! There are a lot of people that think it sounds fun to be a wedding planner (and it is) but don’t take the time to educate themselves on how to do it. I am here to say, don’t hire that friend who is just getting into it. Don’t have your aunt to it. Because it will stress them out and cause way more stress on you than is ever necessary. People tell me all the time, I should have paid you more. I didn’t even realize how much you would handle and the peace of mind that you would bring! Did you know that between Thanksgiving and New Year’s Day, a third of the years engagements happen? The holidays are a popular time to pop the question! With so many engagements, this season has been named “engagement season” by wedding professionals. After the holidays, all the bridal shows begin popping up! In Tulsa, the bridal show season kicks off with The Tulsa Wedding Show on January 5th at the Renaissance Hotel! You can stop by my booth and we can talk about your wedding! I myself got engaged in December. And a few short weeks after, I went to the wedding shows! I can speak from experience, it was a bit overwhelming and a lot to take in! Especially since I was newly engaged and had NOTHING planned! So here are some tips and tricks on how to handle the wedding shows from my personal bridal and wedding pro experience! Go with a plan! Sit down and think about what all you need. If you are just starting out and don’t have anything planned yet, look for venues and planners. Even if you don’t think that you are wanting a wedding planner for the whole wedding, get some information about Day of Packages and schedule a consultation! I always give brides custom vendor recommendations based on their budget and who I really trust! If you already have your venue, look at what other vendors you need, keeping in mind what your venue already provides. Take stickers! Use labels to make stickers with you and your fiancé’s names, wedding date, phone number, and email address. Many vendors ask for you to fill forms out to enter drawings or setup consultations. By making the stickers, you save ourself a hand cramp and time! Setup a wedding only email address. Only use this email address for the wedding! This will keep important wedding emails from getting lost in your main account and make it easier to find everything related to the wedding! *Bonus tip-if you use an email address for your RSVP’s, have them use the wedding email address! Go to the show later! Aim to get there the second hour of the show or a little later if it last several hours. The majority of people get there right as the doors open and it is PACKED! Going a little later will give you more time to talk to the vendors that you want to and avoid the crowds! The last hour of the show is usually the slowest but most brides need about 2 hours to talk to all the vendors that they need to, so don’t wait TOO long! Our final tip is for brides that really don’t like crowds or think that the wedding show experience is for them. If you don’t like the trade show like atmosphere, ditch them and look for open houses! You will get the opportunity to tour a venue that you might be interested in AND visit with some wedding vendors! And the best part? They are free admission! I hope this helps you avoid some wedding stress while getting some wedding planning in! And make sure to stop by my booth at the wedding show because I will be doing a giveaway with Andi Bravo Photography and I have teamed up for the best giveaway! When I got engaged, I knew nothing about wedding and event planning. When I discovered that items could be rented instead of purchased, my mind was blown! Many of the items that you use for a wedding, you won’t ever need again so it doesn’t make much sense to purchase everything. Fast forward to today, I’ve been married for 6 years and assisted in the planning of nearly 500 weddings. I’ve seen people make the mistakes and purchase items when they should have rented and saved stress, time, and money! Here are my top 5 items that should be rented instead of purchased. It can be tempting to purchase linens online with the idea of reselling them after the wedding. But after washing, pressing, transporting, and then having to wash again after the wedding, you end up with an even bigger head ache. Not to mention that you don’t know what the quality of your online linens will be and are usually see through, and the stains that you won’t be able to remove without taking to the cleaners. Rent your linens and all you have to do is put them on the table and then take them off the table! Of course, if we are coordinating your wedding you don’t even have to do that! The same goes for china, cutlery, and linen napkins. Candles can add some romantic light to a reception and be very impactful with little effort. But did you know that you can rent candles? Yep! Florist and rental companies offer candles with the glass cylinders or lanterns for them as well. Make sure to check with your venue to see if flameless candles are required. 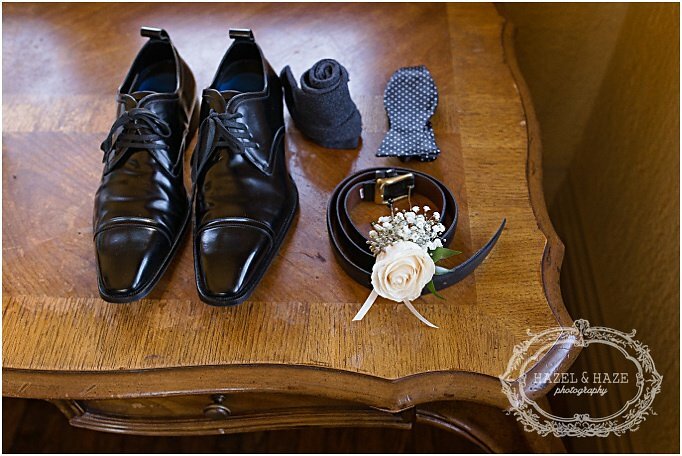 Unless your groomsmen are CEO’s or lawyers, wearing a tux on the regular is not likely. It’s even more unlikely that it will match the rest of the wedding party if they already own one. So, opt for renting a suit or tux. Everyone will match, and they won’t have to worry about it after the wedding! A fancy easel can be expensive to purchase. But renting can cost a fraction of the retail purchase price! 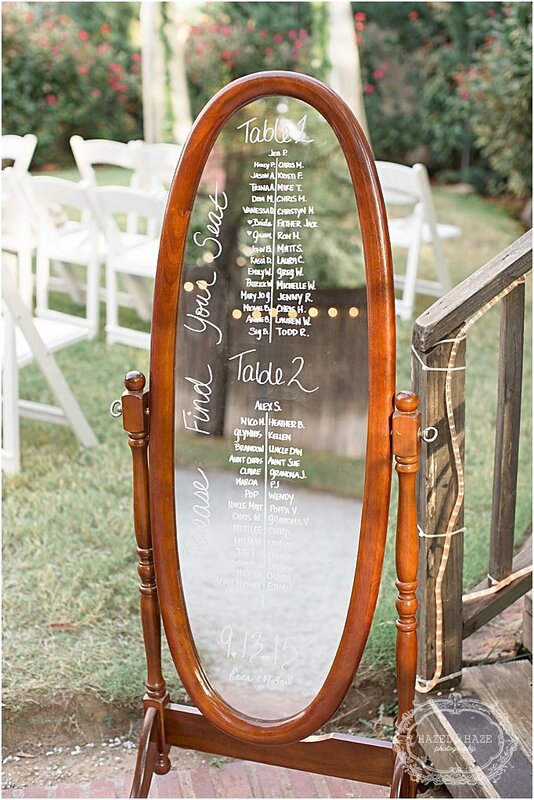 Plus, what are you going to do with a big easel after the wedding? Check with your cake bakery to see their selection of cake stands! They will usually be able to give suggestions on what will match your cake design! If you are making your own cake, check your local event rental location to see their selection! Not sure where to rent these items from? Send us an email you we will send you are favorite local vendors list! Wow! My baby is turning three! I have always wanted to share his birth story but have never sat down to write it. I’ve always loved reading others birth stories. I think even more so after giving birth but I wish that I would have seen a story like mine while I was still pregnant. I hope that by sharing the story of Willem’s birth, I can encourage and bring comfort to someone else. When I found out that I was pregnant, I was full of so much excitement and all the wonder of any first time mom! We decided that we wanted a natural birth without any medical intervention. I watched The Business of Being Born and and enrolled in Bradly Method classes. I had other friends that delivered naturally or were also planning on having a natural labor. Throughout pregnancy, I felt so empowered and confident! I LOVED being pregnant (with the exception of a few weeks of morning sickness). I had a very easy pregnancy, enjoyed feeling him move inside of me and dreaming about what was to come! Once we hit around 30 weeks, we started noticing that Willem was breech. My OB had a hand held ultrasound machine and would check at each appointment just to take a quick peek! We loved getting those little glimpses of him at each appointment! I tried all the tricks that were suggested on Spinning Babies, visited a chiropractor, and even stood on my head (yeah, that was a site to see!). A procedure to turn him was costly, dangerous, and not always affective so we elected out of it. My 37 week appointment was the deadline to make the decision to schedule a c-section if he hadn’t turned. I was so nervous going into that appointment. A few days before, he was finally sideways so I became extremely hopeful that he would find his way head down! Once I went in, I told my OB that I just wanted to find out his position and then we could go over any other stuff. Much to our disappointment, he was head up. He was footling breech which is especially dangerous if you go into labor because basically, the baby can begin being born but then get stuck. Yikes! His due date was October 8th and as I had learned in my Bradley Method classes, due dates aren’t always accurate and I just wanted my baby to be ready when he was born so that he wouldn’t need any special medical attention! My OB allowed me to schedule for October 6th but wouldn’t let me go to 40 weeks. At the pre-op anointment, I began crying because they kept talking about the c-section process over and over again. I had to go back to my job at the time and cried all day. I REALLY didn’t want a c-section and was so distraught over having to schedule one. I told my mom that I just wasn’t going to show up and nobody could make me. Talk about hormones, right? I kept wanting to say “but we are hoping for natural!” My mom came by to see me and brought me some baby samples that she snagged at her job (she works in the NICU of the hospital!). Se told me that she knew I was upset but babies are smart and know more about whats going on in there than we do. Those words didn’t sink in until after Willem was born. A few days later on the 26th, I went to work as normal. There was a wedding that day, but I left early because the rest of the team had it all handled. I was having terrible back pain but #9monthspregnant what’s new? I also had a sudden burst of energy that I hadn’t had in months! With only one week left of work before I planned on going on maternity leave, I had a few final things to do over the weekend that I planned on getting done so we could have time to relax before our son arrived. That night I went to Buy Buy Baby to use our gift cards from baby showers and get a few random things that I really wanted! My husband was out with from friends and I settled myself in at home to watch some Gilmore Girls! I had barely gotten 10 minutes into an episode before I thought that I had just peed a little bit. I got up to go to the bathroom with and quickly realized that my water just broke! I called my husband and told him he needed to come home immediately. All the training of remaining calm and taking our time kind of went out the window but I also knew that my baby was breech and faced a different set of circumstances than what is typically preached. I tried to gather up some things because I still hadn’t packed a hospital bag (that was on my to-do list for the next day). My husband was in a completely different state of mind. I was trying to breathe and make it through the contractions that suddenly came about! My husband was just out having fun with friends and was in a hyper mood. I’d be lying if I said I didn’t want to slap him. We loaded up the car, and I called the hospital on our way there because I didn’t know what door would be unlocked! It was about 11something PM and I knew that only a couple entrances remain open after 8. In the car we began timing my contractions. They were less than 3 minutes apart. When we arrived at the hospital, I waddled in and started getting checked in. I still roll my eyes because the nurses treated me like I was likely not in labor. I am sure that they get a lot of false calls and are used to having to turn first time moms away but there was no doubt that I was in labor! In fact, when the nurse was checking to see if I was dilated any, I was not only dilated, and she not only confirmed that my water broke, but she felt my sons foot. Yup. He was so low that his little foot was about to pop out. They quickly began taking me seriously after that. I was congratulated on winning a c-section that night! After prep, being poked and prodded (it took nurses 8 times to get my IV in because apparently my blood flow was so strong it bent the needle) we were finally wheeled into the OR where I got the most magical relief. The spinal block felt like a bee sting for a second but the relief quickly took over the pain of the contraction that I was in the middle of. It was weird having slight feeling but no pain. My husband looked over the curtain while they pulled him out and shouted “he has hair!” and then he began crying! I burst into tears of emotion and just wanted to hold my baby! They gave me a quick peak before taking him to be weighed and swaddled. He was born at 1:07 on September 27th, 2015! I was so thankful to know one of the attending nurses who took my phone and took pictures. I was able to do a little skin to skin while they sewed me up and even nurse on the table. After getting all fixed up, we were taking to another room while the anesthesia wore off. This part of blurry to me. I’m not sure if I fell asleep or if I was just in a comatose state. I remember not being able to sit up much because it made me nauseous, throwing up after trying to drink water, and nursing with 2 other people helping because I was so groggy! I have glimpses of my sister coming in, and everyone says that my husband wouldn’t let anyone hold Willem! We were in sock and awe that we had just had our baby! If you are going to visit at the hospital, call or text before you go and then call or text again before you walk into the room because things can majorly change within 30 minutes. Even though I had to have a c-section, I still got what I wanted most; I wanted my baby to come when he was ready. When he was born, they found his cord wrapped around his neck and body. He didn’t have any slack left that he could turn! If we would have tried to turn him and delivery naturally, he could of potentially gone into distress and it would have been very dangerous. After everything, I have a happy and healthy baby. He’s turning 3! And I would do it all over again! Having to schedule a c-section gave me the time to accept the fact that I would very likely have to have a c-section and not be allowed the natural labor I hoped for. I was able to process it and move forward with those plans. I asked my OB before being discharged the likelihood of a VBAC and since I had to have a c-section because of a baby circumstance and not circumstances of my body, I will likely be a candidate with the next baby. Whenever it is time for baby number 2, I think I will be able to handle understanding that babies do what babies want to do. My son is still extremely stubborn. And we should have known from the beginning that he would be the boss. In every hardship, I always try to search for joy and find the lesson in it. I don’t really know what the lesson was from the frustration of having a cesarean vs. the natural birth that I wanted, but I find joy and peace knowing that I had my son in the safest way under the circumstances. Nobody could have prevented it, and nobody would change it. But I eventually (after many tears) chose to embrace it and let God continue to write my story. Currently, it's 70 degrees in August and I am wearing a hoodie. My heater kicked on yesterday and we thought that something was burning or our house was on fire someplace. These cooler temps are making me anticipate fall and I have to share one of the most beautiful fall weddings that I have ever had the privilege to coordinate! These rich reds, navy, and gold make me reminiscent and full of anticipated for fall weddings! Bayleigh and Bryce wed at The Springs in Tulsa surrounded by their closest family and friends that came from all over the country! The bride and groom were high school sweethearts and their nuptials were "a long time coming" (quote directly from the bride!). I loved all their photos from when they were younger and just started dating that were displayed throughout the reception, and seeing the progression of their relationship through photos. Bayleigh was a STUNNING bride! Dipping the bride is surprising more complicated than you would think! But Bryce and Bayleigh rocked it and got this amazing photo doing it! The brides dress was absolutely stunning! The handmade lace and beading details were even more striking in person! 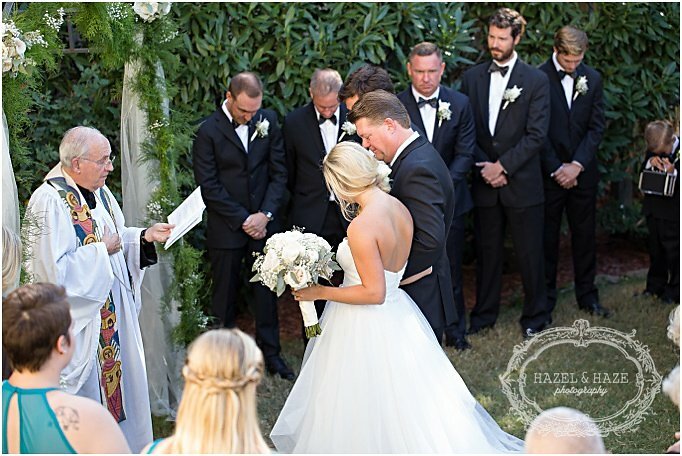 This photo of Bayleigh and her father right before they walked down the aisle is one of my all time favorites! I always ask the bride and her father if they are ready before I open the door and tell them to take a deep breath. They were so ready and comfortable in this moment! Tasha never disappoints with the flowers! This fairy begins much like any other... Once upon a time, there was a girl named Margaret who was smart and witty. She had a friend in high school name Patrick who was wise and grounded. They were "just friends" but enjoyed each others company. It wasn't until Patrick moved away for college that the two realized how much they liked each other and didn't want to be apart! They stayed in touch, for fear of losing the other and their relationship continued to develop, even over the distance. After nearly 10 years, the two decided that they wanted to take their happily ever after to the next chapter! 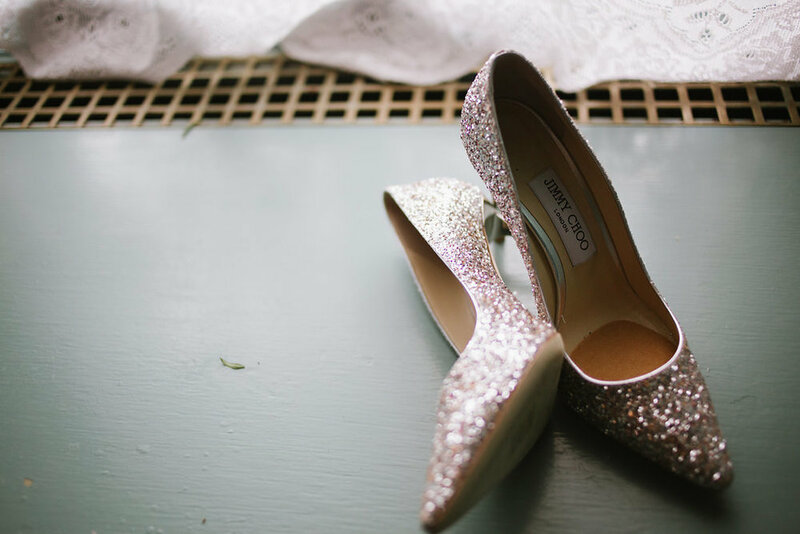 Every princess needs a pair of sparkly heels! Dresser Mansion was the perfect fit. Intimate, full of history, and looks spectacular! I've never had a groom as happy and giddy on wedding day as Patrick! I only met him a few times throughout planning but one the day of the wedding, his excitement was radiant! The Wild Mother did a spectacular job on the flowers! These centerpieces were especially reminiscent of 'Beauty and the Beast! The dessert buffet from Round House Bakery was AMAZING! Congratulations to Margaret and Patrick! Thank you for allowing me to plan and design your wedding! When Margaret contacted me about planning her wedding, she had already begun started the process but was eager to continue although she was not sure where to go from there. She chose a romantic pallet of burgundy, blush, and cream. Her blush gown was one of the first things she chose and became partial inspiration for the rest of the design. One the day of the wedding, every detail was perfect! The weather was just right, not too hot, not too cold. Just right. The music, flowers, food, cake. Every detail came together perfectly, just as planned. And so, Margaret and Patrick lived happily ever after! Every place setting was special and unique. White and blue mix matched plates came from family members along with the napkins and silverware. A simple butter cream cake was adorned by greenery and fresh blooms! The grooms love of golf was celebrated with his cake- a surprise to him! Tasha Bartholic always has the prettiest work! Exchanging letters and gifts before the ceremony is always so touching. Katie and Payton still had not seen each other yet. In fact, they didn't see each other until the ceremony...keep scrolling! Yup, she blind folded him! When Katie told me her plan of doing photos prior to the ceremony but NOT seeing each other, I thought she was crazy. She explained to me how she had a friend who had done it and it worked out great for them! 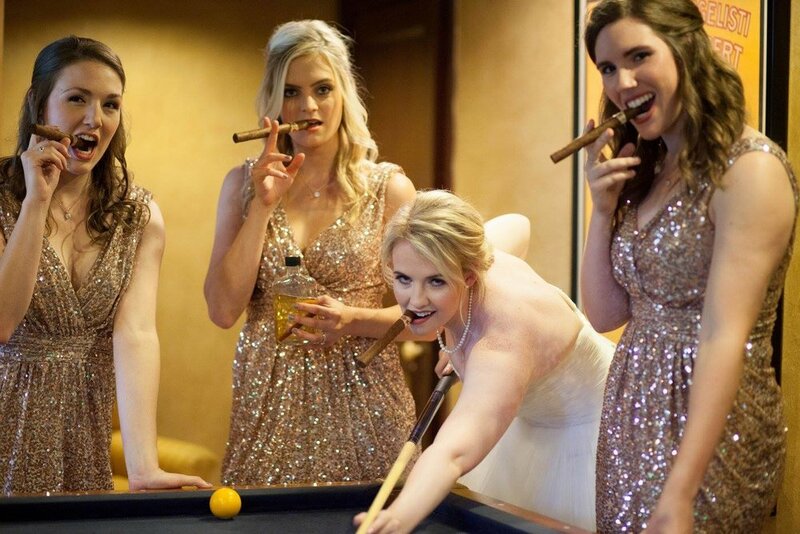 It takes some strategic placement, and some serious self control from the groom! But they pulled it off! Katie stood just out of Payton's sight. Once everyone was in position, they took off his blind fold! See? Honestly, props to Payton for not instinctively turning his head to look at Katie! Both of my Miller couples! I coordinated Stephanie and Austin's wedding almost 2 years ago. At the time, Katie and Payton were just dating. When they got engaged, Katie called me to coordinate her wedding! I love seeing couples after their wedding and staying in touch! If you have ever been the The Springs Tulsa, you know the landscape is stunning! There is a hidden path that takes you down to the lake which is where this stunning shot was taken! I loved being the day of coordinator for this wedding. Enjoy the video below to see more from the Tulsa wedding! This wedding! I first met Jordan and Kyle when I gave them a tour of Dresser Mansion, which they ultimately chose as their wedding venue! She began telling me her vision for donuts, mimosas, and all the brunch details for her wedding. The details came out perfectly and this wedding has been getting quite a lot of buzz! 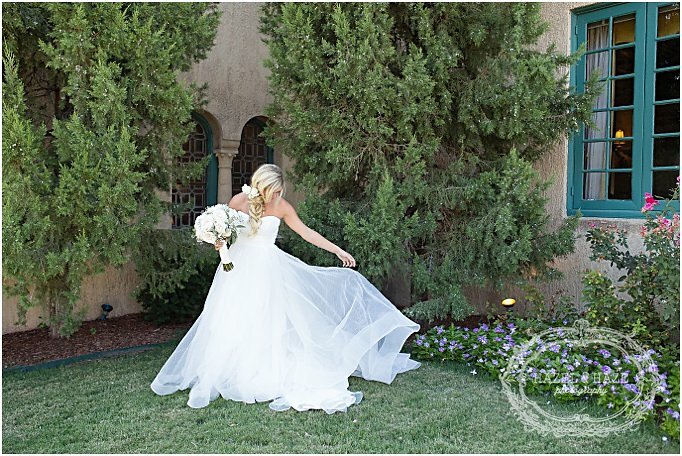 It's been published on RuffledBlog, and at least once a week a bride come and asks me who styled the arbor! The morning of the wedding it began raining (cue the umbrella pic above! ), but it still couldn't have turned out more perfectly! The rain cleared JUST in time for the ceremony and the over cast skies provided the perfect lighting. Jordan's style was totally covet worthy. Her Maggie Sottero dress was breathtaking with a ruffled skirt and beaded bodice. Her pear cut engagement ring was also absolutely stunning! Crooked Roots blew it out of the park with the floral design! This arbor has been the most pinned, requested, and asked about arbor of the year! I never would have thought about using pompous grass in this way but it totally works and looked incredible! It was a little "fluffier" before the sprinkle but it still looked awesome for the ceremony! 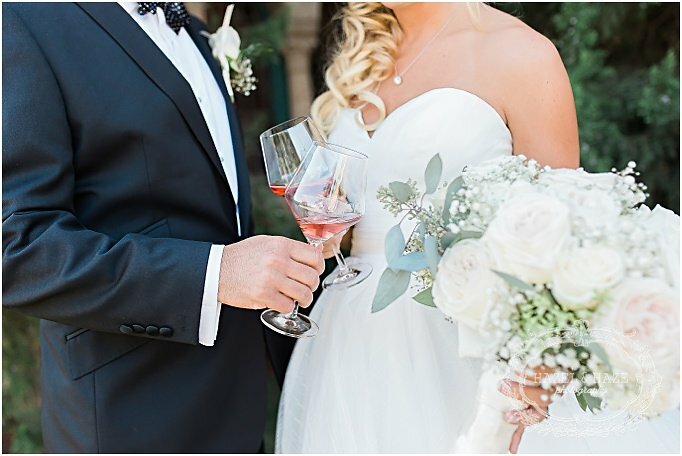 "A Sunday kind of love..."
The flower cuffs instead of bouquets was one of my favorite details! Finally, they are married! I have a few favorite moments that I look for at every wedding. One of them is when the bride and groom begin walking down the aisle as husband and wife! There is so much joy and excitement in that moment! Jordan wanted something different once again when it came to the photo booth! This vintage VW van is the coolest photo booth that I have ever seen! Guest were able to climb in, grab some props, and take pictures! And at the end of the day, it doubled as the get away car! Laurannae Banking Co. made the sweetest cake! It might look like pancakes, but it actually cake that they made look like big fluffy pancakes! Immediately before cutting into the cake, Jordan and Kyle drizzled it with maple syrup! What is brunch without mimosas? The donut bar was a hit! If you have every had anything Antoinette Banking Co., you know it's amazing! Laurannae Baking Co. not only making fabulous cakes, but they also make gourmet cupcakes and have an adorable cupcake trailer! We ended the day with an outfit change and ribbon wand send off! The place cards hanging from the trees were one of my favorite details. I love when brides get creative with the little details! Alfred Angelo Closed, Now What? If you are a bride who was effected by the abrupt closing of Alfred Angelo, we are here to help! Everyone within the wedding industry is collectively standing with you, ready to help any way we can. I have compiled a list of information for brides that have already ordered dresses from Alfred Angelo and a list of local bridal dress shops that are stepping up to help! Facchianos is having a store wide sale and has dresses available for a fraction of the original cost! Abelina's Boutique is currently having a sample sale! You can snag a dress right from the rack at a great discount. Bridal Elegance has the largest selection of bridal gowns in Tulsa and is having a sale to help accommodate all the brides left in the dark. Chantilly Couture is a short drive to OKC and hopes they helps alleviate a little bit of the stress you may be going through. So, they are offering 15% off your entire purchase for those of you that have been affected. Something Borrowed Consign sells barley worn wedding dresses and accessories. You can find top designer dresses for a fraction of the price! The team of JJ Kelly would like to help by offering 15% off any gown in inventory, even from the sale room! In regard to receiving your money or dress- If you paid for your dress with a major credit card, you are protected and can be refunded by contacting your credit card company. Either call the number on the back of the card, or go online to the credit card company's website. "Alfred Angelo filed for Chapter 7 bankruptcy on July 14, 2017. As a result, all Alfred Angelo stores, corporate offices and Alfred Angelo wholesalers are closed. Margaret Smith is the Court appointed Chapter 7 Bankruptcy Trustee. If you wish to be contacted regarding your order status, please send an email to alfredangelo@mjstrustee.com. In your email, please include your order number, name as it appears on your order and the location of your purchase. We will post additional information regarding the status of pending orders on this website as it becomes available or otherwise contact you as we receive more information regarding your purchase." If you have not received your dress yet, it’s possible your dress is still in the store, is still being shipped, or is with a seamstress. Alfred Angelo has given the name of the attorney handling the case but with the overwhelming amount of people contacting them, it might take a while for them to get back you. Most sources are saying that if your dress was in store when they closed, your seamstress has it. If you do not have your seamstress' contact information, it might be posted on the door of the closed store. The attorney is Patricia A. Redmond. You can email predmon@stearnsweaver.com or call 305-789-3553. The best way to contact her is likely through email. Getting a response will take time, so be patient. If you don't have time to wait for an answer, contact the stores above! This tote. Let the world know who's boss, and mom, and wife. It is appropriately called the "Say My Name Tote"
Some Williams-Sonoma Peppermint Bark. Because we all know this is the best stuff in the world. Foot Duvets. These slippers! So comfy, warm and soft. This Cook Book. This cookbook is full of comfort food with a modern twist. I saw Chrissy make her chicken pot pie soup with crust crackers on the Today Show and it looked amazing! Here is my gift guide for the men in your life. Disclaimer-it is totally biased towards what I would get for my husband. So, you're welcome. Or, I'm sorry. Beard Balm. Men are growing out their beard for full, lumberjack glory. This Beard Balm conditions and keeps their skin from getting itchy. A new power tool. Bonus, you might be able to more easily persuade him to get some of those Honey-Do's marked off the list! The cool tech toy of the year, the Amazon Echo Dot. This gadget is so cool and handy. It can play your music, turn lights on/off, flip switches, control your sprinkler, open/close the garage door. And that's just some of what it can do! Whiskey Stones. Keep your drinks chilled without diluting them with this stainless steel and grey basalt rocks. A Monthly Subscription to his favorite thing. AmazingClubs.com has subscription options for cigars, beer, coffee, bacon, jerky, or whatever suites your dudes fancy. It is a gift that last all year long! Need a gift for your girl friend? Check out yesterdays Gift Guide Here. Here are a few of my favorite things and gift able items! This blanket. Someone gifted me this blanket at a gift exchange and it is the most luxurious, softest blanket I have ever felt! It is so affordable too! This candle. Because everyone loves an Anthro candle! I love indoor plants. I think it brings balance and adds a little bit of life and happiness. But I do not have a green thumb! So easy to maintain plants are perfect and great for gifting since it's low pressure for the gifted to keep it alive! This pot is from Amazon and you can pick up a succulent from a local nursery. The Corkcicile Canteen is legit! It comes in so many great colors and keeps you drinks hot or cold for up to 24 hours! Next up, The Holiday Gift Guide for your Hubby! Amy and Kyle were a joy to work with! Amy was probably the most organized bride that I have ever worked with. She was stunning on her wedding day and Kyle was so smitten for her! They had a lovely ceremony at Dresser Mansion and then headed downtown to AHHA for their reception. I provided their ceremony coordination. Enjoy these photos of my favorite details from their wedding day! Stephanie and Austin were such a fun couple to work with. They are hilarious and were always making me laugh. Their wedding was full of pretty details and I had fun being a part of it. 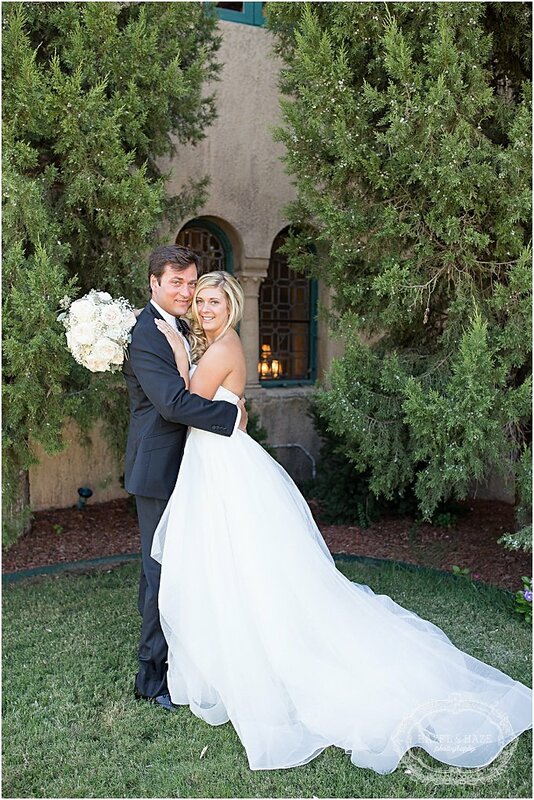 Erica and Michael planned their Tulsa wedding all the way from Connecticut. They came to me in search of someone who could offer day of coordination so they could relax the day of the wedding. 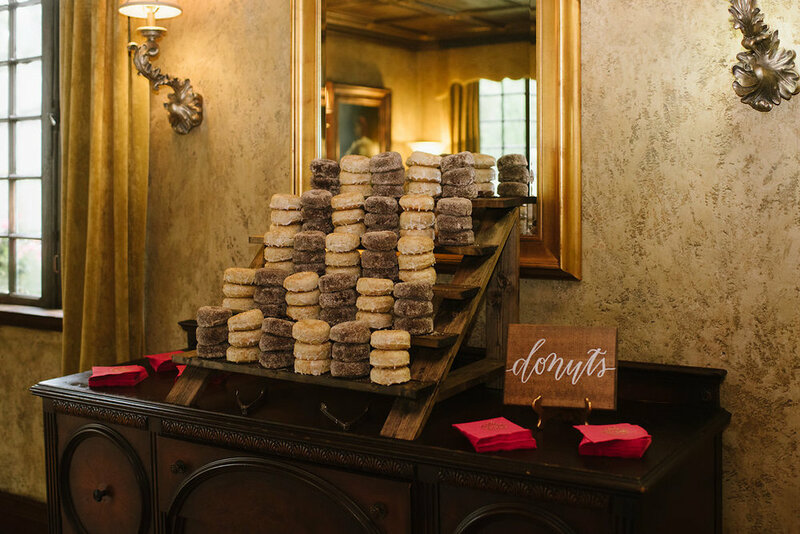 At the time, I had just started offering day of coordinating, and I would already be working with them through their venue so it was the perfect fit! 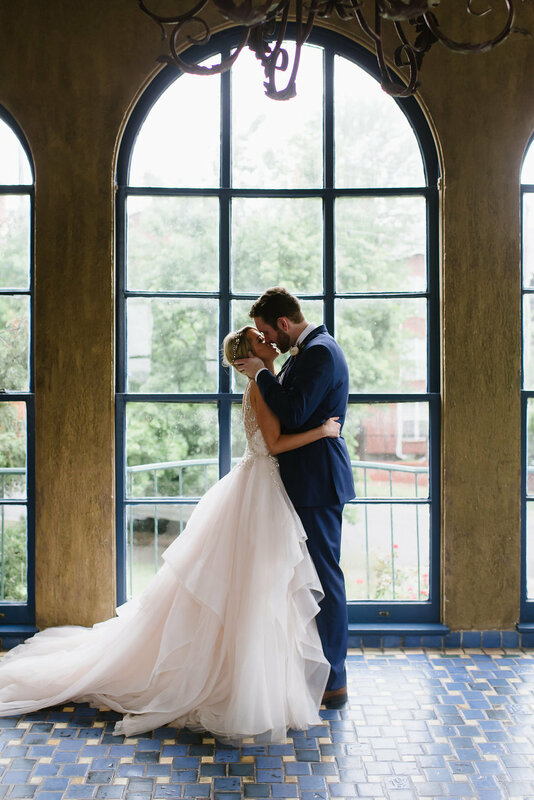 I loved everything about their intimate wedding! They had less than 100 people and everyone present was so near and dear to their hearts. Friends and family came from all over the country came to celebrate with the couple. Below are some pictures of my favorite details and moments. Enjoy!